Bluetooth® and GPS trackers are everywhere right now. It seems that whatever you’re concerned about losing can be tracked. People are attaching tracking beacons to everything from their house keys and luggage to the bumpers of their cars. Heck, you can now attach trackers to your kids for monitoring when they go out of a designated safe zone! As I’m sure you’ve been seeing lately, contractors in every corner of the country are tracking tools. Plus, it seems that new tool tracking solutions are hitting the market every week. Big brands like Milwaukee™, DeWalt™, and Bosch™ have beacon-based tracking solutions that are getting a lot of attention – but are the beacons really that reliable? Range, battery life (both for your phone and beacon) transmission frequency and type of batteries required are all things to consider. I took a deeper dive into this technology so you can determine if it’s the right fit for keeping track of your tool inventory. Powered by either Bluetooth or GPS technology, items are tracked by a beacon – attached to the tool internally or externally – letting the user find its location on a map from his/her smart phone or tablet. External beacons are purchased individually from the manufacturer or big box retailers like Home Depot or Lowes and require being attached by zip tie, screws, or adhesive to every tool you want to track. This, at the very basic level could be the first problem. 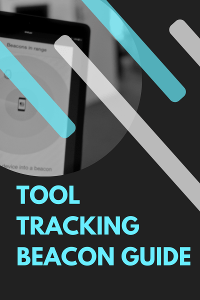 Removing or destroying the beacon is generally easy, so if you’re using beacons to help cut down on the theft of your tools, you might be frustrated by the results. Bluetooth and GPS. What’s the difference? At a high level, the difference Bluetooth and GPS technology is really defined by how the beacon signal gets from the beacon back to you in the office. Bluetooth uses a nearby phone to pass the signal from a tool to a phone and then up to the cloud and back to you. GPS beacons bypass the phone and send a signal directly through a telecom network up to the cloud. Range is an important distinction when talking about a product designed to find tools that may be a hundred miles away or more. As a general rule of thumb, Bluetooth is used to locate the beacon attached to your tool within 35 – 100 feet of your phone location. GPS satellites can locate a beacon further away regardless of whether there is a phone nearby. Whether using GPS or Bluetooth, both rely on getting an unobstructed signal out. As anyone who has ever had satellite radio in their car knows, things often do get between the unit and the satellite, so losing the signal is a frustrating reality. Despite the reassurances from tool tracking beacon companies, signal obstruction issues do often happen when a tool is left under a structure, inside a building or under a pile of debris in a truck. As we all know, on a construction jobsite, the items mentioned in the quote are just a part of the job in our daily world, so relying on Bluetooth for finding tools can be a challenge as well. Plus, as anyone who’s ever synched their phone to their car via Bluetooth knows, resetting your Bluetooth is an all too familiar and necessary ritual. Here’s one last thing on this subject. It’s important to note that many of these beacons aren’t “true” GPS. Often times the beacon relies on an expanding network of users to help pinpoint the location of an item. In other words, the user won’t get a ping notifying him/her of the location unless another person in the network walks near the lost or missing tool, triggering a notification. In this regard, you can distinguish a true GPS solution by the monthly or annual data plan that needs to be purchased for the beacon. If you aren’t using a phone to pass information, then you’ll need to buy the data plan for the beacon to access the telecom network directly. This adds yet another layer of complexity to the seemingly simple goal of tracking your tools. This submitted review on Google® Play regarding the battery life of one of the more popular beacon apps seems to highlight a frequent complaint among users of this technology. Since the beacon apps rely on your phone to give you the status of where a tool is located (the GPS location), keeping your phone on and active to maintain your GPS can quickly wipe out your battery life. Many contractors have reported a fast battery drain by keeping the phone on and in constant “tracking” mode. The beacon batteries themselves also require changing. The typical lifespan of a beacon battery is about one year before needing to be replaced. I’ve highlighted this particular review because accuracy and location reliability seems to be a recurring issue with these Bluetooth or GPS Beacons. Often the location updates are spotty and can take hours to give you an idea of where a tool is located. Or once a tool is located, the refresh on the App might take awhile, meaning the tool may no longer be where it was first reported. Also, because many of these beacons use your mobile device’s location when it’s near a tool to show where it was last tracked, you’re truly relying on the hope that you or someone in the App’s network has been near the missing tool. The chances of finding the tool are slim unless that happens. Many contractors have also reported reliability issues when working on remote jobsites. This is due to the mobile device having to receive data regularly from the network, so if a job takes you into a rural, forested location where mobile service is weak, the app is not very useful. As I wrote in a previous article (link to last post), a better solution for your business might be to look at tool tracking Apps that assign accountability to a person who “signs out” a particular tool. These App’s don’t rely on beacons to track tools but rather shift the responsibility to the person last assigned the tools. It’s about peer-to-peer sharing of data, managed in the Cloud rather than satellite or Bluetooth tracking. An App like ShareMyToolbox, creates a “catalog” of tools and assigns the asset (the tool) to an employee who “accepts” it in the App. His/her responsibility for the tool is easy for everyone to see and once the tool is returned to the warehouse, the name of the borrower is removed as the responsible party. Any transfer of the tool to another employee is tracked by the employee transferring responsibility, along with the tool, from person-to-person. When a member of your team knows that there’s a digital record of who has a particular tool, they won’t leave it lying among piles of debris on a remote job location. Instead, that person will be more compelled to return it to the inventory that you’re managing. Decide what it is you want to accomplish. GPS and Bluetooth based beacons are continuing to evolve and will be an important part of your tool tracking strategy in the future. But until range, and reliability improves, utilizing an accountability-based App might be a stronger, more reliable option for keeping track of most of your tools. With a responsibility-based solution already in place, then a beacon option could be used to add extra security for a few important tools, creating a full, well-rounded strategy for maintaining your tool inventory. To learn more about accountability-based tool tracking, check out this tool inventory app video.